Bring your pet on your Oregon Coast vacation and explore our many dog-friendly areas. Does your dog love to swim? Cannon Beach and Manzanita beach are both pet-friendly! More of an explorer? The Arch Cape area offers endless dog-friendly hiking trails for you and your furry friend. These things and more make the Oregon Coast a great place to vacation with your pal! With all of the pet-friendly activities that the Oregon Coast has to offer, you will need a comfortable place to lay your paws at the end of the day. 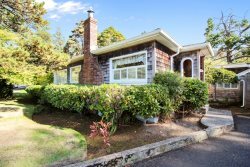 With large yards and patios, our pet-friendly vacation rentals in Cannon Beach and Arch Cape provide plenty of space for your loved ones to play and rest. Nearby dog-friendly restaurants make our pet-friendly rentals perfect for any vacation with Fido. Book your Cannon Beach pet-friendly vacation rental today!